A small shop with a big heart. 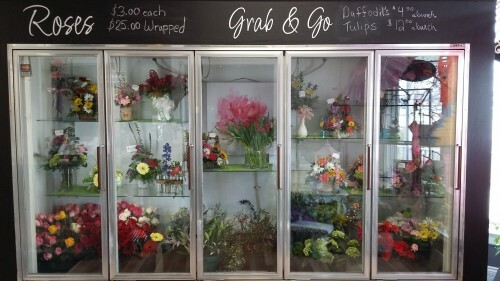 Everyday looks better with flowers from Austin's Florist & Gifts... Call us today! 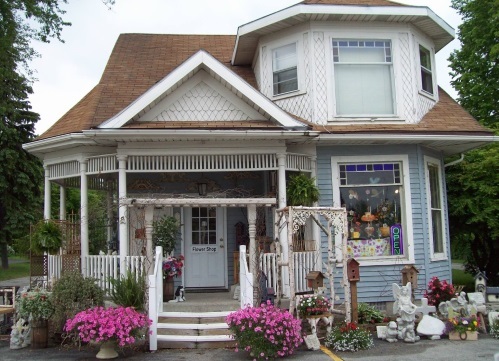 We're a local Freeland, Michigan florist with a lovely variety of fresh flowers and creative gift ideas to suit any style or budget. Our designers bring over 40 years of experience in pleasing customers and designing in all styles from traditional, to woodsy, to modern. Family-owned and operated. Made with care to show you care. Our shop is located in Freeland, Michigan, in the heart of the tri-city area for over 35 years, and just a hop and a skip away from Bay Cit y, Saginaw and Midland. It is our pleasure to assist you with any local, as well as worldwide deliveries and remember that corporate accounts are always welcome. For your convenience, we offer daily floral delivery to local funeral homes and hospitals. We hope you enjoy your online shopping experience with secure 24-hour ordering right at your fingertips. If preferred, you may call us to place orders direct at (989) 695-9100. Send sympathy arrangements and funeral flo wers from the heart. You can always depend on our courteous staff to help you with ordering flowers after a friend or loved one passes. We will design and deliver a funeral arrangement that beautifully conveys your expression of sympathy and serves as a lovely memorial to the deceased. 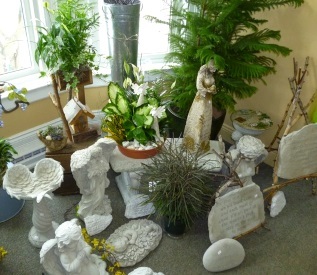 We carry a large selection of silk memorials, cement figures, angels, keepsake cement benches, keepsake crosses, keepsake lanterns embellished with fresh flowers or silks all to personalize and treasure the memories of your loved one. Add the beauty of flowers at wed dings, parties and special events. Your big day is our big day. Here, at Austin's, we treat every wedding as uniquely different as the bride and groom. Our talented design staff is ready to help you plan the bouquets, arrangements and on-site decorating for your dream wedding or any festive occasion - large or small. Call in advance at (989) 695-9100 and set up an appointment for a consultation. We're ready to hear about your dream wedding and create a plan that fits you... and your budget. You'll find a nice selection of house plants and unique all occasion gifts. Choose from our Green Plants, Blooming Plants, Dish Gardens, Seasonal Potted Flowers, Watch & Grow Bulb Gardens, Succulents and Air Plants. We also do custom Fruit Baskets, Gourmet Baskets, Gift Baskets, Baby Gifts, Candy & Chocolates, Gifts, Deer & Wildlife Figurines, Angels, Greeting Cards, Home Decor, Scented Candles, Garden Gifts, Wind Chimes, Bird Houses, Statuary, Silk Flowers, Wreaths, Plush Stuffed Animals and Balloons. 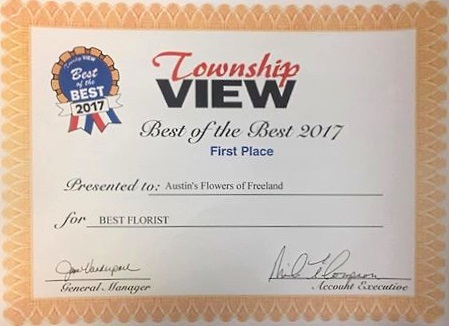 Thank you for visiting our website with convenient online ordering and flowers delivered fresh from your local Freeland, MI flower shop Austin's Florist & Gifts!